Flash blend with 2 cups of pebble (or crushed) ice, pour into a glass, and garnish with an edible flower. 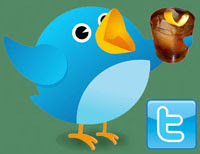 (*) Perhaps substitute Averna or Amaro Nonino. Two weeks ago, I had the privilege of attending Tiki By the Sea, an annual event held in Wildwood, New Jersey, for the past four years. 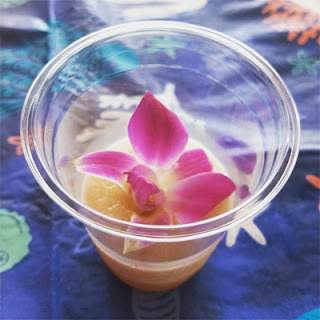 It was a mix of seminars, competitions, bar pop-ups, and other educational and fun happenings that focused around tropical libations, Tiki history, hospitality, and bartender health and wellness. During Jon Arroyo's "The Art of Blending Frozen Drinks" seminar (a write up will follow shortly), he presented one of the many Zombie variations that I had the pleasure of tasting during the event. His was a blended amaro-forward one that was rather delightful. Once prepared, it offered up a caramel and cinnamon nose that led into a caramel and citrus sip. Next, rum on the swallow was complemented by cinnamon and absinthe flavors. Stir with ice, strain into a Nick & Nora glass (cocktail coupe), and garnish with a flamed orange twist (unflamed twist). 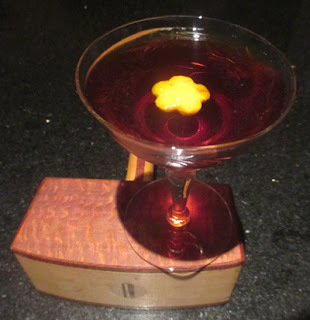 Two Wednesdays ago, I was browsing the BarNotes app for a cocktail to make, and I spotted Abigail Gullo's Longshoreman that seemed appealing with rye, Averna, and Punt e Mes. Since it was close to Misty Kalkofen's Brooklyn Brawler, I opted for Abigail's Bourbon variation that she crafted in 2013 at New Orleans' SoBou called the Big Chief. 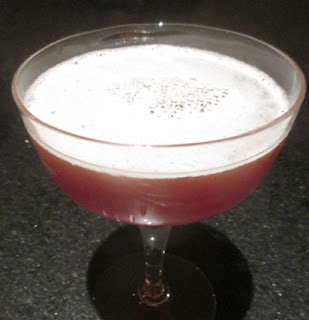 Her riff on the Red Hook was described in a PunchDrinks article as having been "named after the Big Chief Indians down here in New Orleans that lead their tribes in the St. Joseph's Day parade." The Big Chief greeted the senses with an orange, Bourbon, herbal, and grape aroma. Next, Punt e Mes' grape and the Averna's caramel mingled on the sip, and the swallow gave forth Bourbon and bitter fruit flavors including orange and cherry. 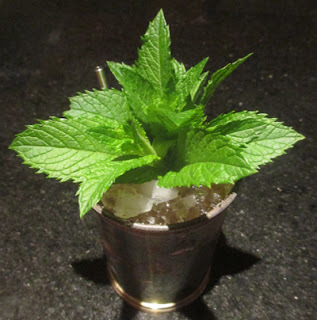 Muddle the mint, add the rest of ingredients and crushed ice, stir, top with crushed ice, and garnish with a mint sprig. Two Thursdays ago, I reached for Sarah Baird's New Orleans Cocktails and spied the Sunday Morning Coming Down. I was lured in by it being a Julep with Madeira as well as being a Johnny Cash song reference. I later learned that the song was written by Kris Kristofferson and recorded in 1969 by Ray Stevens a year before Johnny Cash turned it into a number one hit. The recipe was crafted by Isaiah Estell of Cavan, and the rum, Madeira, and mint reminded me of the Take the Long Way Home. The Sunday Morning Coming Down offered up a mint bouquet to the nose that preceded a grape and caramel sip. Next, rum, grape, orange peel, dried fruit, and mint flavors fill the swallow. Building a Collins glass (I strained out the muddled ginger), fill with crushed ice, and swizzle to mix and chill. Top with crushed ice and garnish festively (mint sprigs). 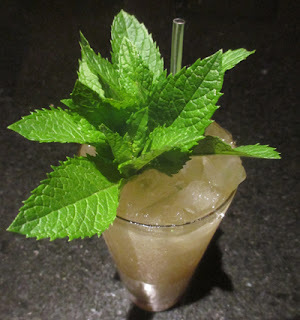 Two Wednesdays ago, I returned home from work and raided my garden for mint to garnish my evening's Swizzle. The recipe that I was excited to make was the Passion Grove Swizzle crafted by Matt Pietrek on his CocktailWonk blog. Since Matt insisted that ginger notes were necessary to complement the pineapple, I ended up muddling ginger into the mix to supplement the rather mild Velvet Falernum that I have. Once prepared, the Passion Grove Swizzle presented mint over rum funk aromas. Next, lemon and hints of pineapple on the sip gave way to funky rum, passion fruit, pineapple, and ginger elements on the swallow. Two Tuesdays ago, I finally got around to purchasing a replacement for my empty bottle of dry vermouth so I could make a Negroni variation that I intended to make a few days before during Negroni Week. That recipe was the Leave Me Alone by Phillip Childers of Manhattah's Middle Branch that he crafted at one of Gaz Regan's recent Cocktails in the Country retreats (Gaz published the details in his newsletter). Once built, the Leave Me Alone shared an orange oil bouquet from the twist that complemented the Campari's orange which melded into the gin's pine aroma. Next, a deep grape sip led into pine and a bitter orange flavor that was intensified by the gin with a dry quinine and orange finish. 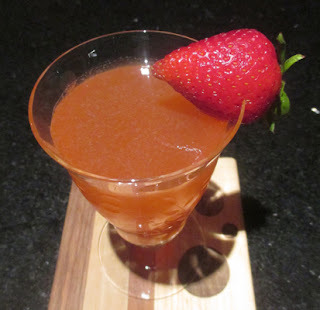 Muddle the strawberry, add the rest of the ingredients and ice, shake, and double strain into a cocktail coupe. Garnish with a half strawberry. When I opened the refrigerator door two Mondays ago, I was reminded that we had purchased our season's first strawberries. My mind instantly turned to recipes that I had spotted in the Death & Co. Cocktail Book that called for them, and I ended up selecting Thomas Waugh's 2009 Straw Dog. A straw dog is both a sham creature made of straw as well as an argument or opponent set up so as to be easily refuted or defeated. In the glass, the fresh scent of strawberry mingled with floral notes from the blanc vermouth and smoky aromas from the Scotch. Next, a semi-dry lemon and white wine sip gave forth a vague berry note, and the swallow began with smoky Scotch that transitioned to an herbal strawberry flavor at the end. After my work shift two Sundays ago, I wanted to treat myself to a drink despite it being at such a late hour. Therefore, I opted for a low ABV recipe from the fortified wine-based section of Pioneers of Mixing at Elite Bars: 1903-1933 called the Octogenarian. Perhaps sherry had a bad rap even back then as being an old lady's drink as Derek Brown once spoke about. In the glass, my choice of Amontillado as the sherry provided a nutty bouquet along with the anise and floral orange aromas from the other ingredients. 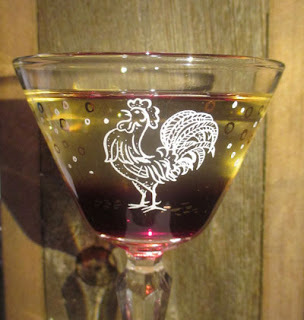 Next, orange and grape mingled on the sip, and the swallow proffered grape, nutty, orange, and absinthe spice flavors. Overall, the combination reminded me of something William Schmidt would have created circa 1890, as well as a Fancy (and slightly Improved) Adonis. Combine over ice (shake all but the sparkling wine with a few ice cubes, add the champagne, and pour into a bowl). 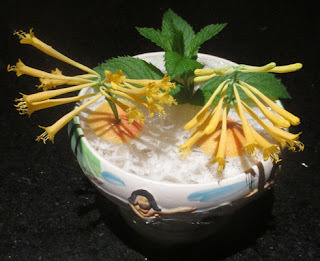 Fill with crushed ice and garnish with lime wheels and orchids (mint sprig and honeysuckle blossoms). Two Saturdays ago, I bought pineapple juice to make a recipe that I had spotted earlier in the week in Tom Sandham's World's Best Cocktails. That drink was Julie Reiner's Gold Coast Punch that she had created at Lani Kai in Manhattan; I was drawn to the combination for the rum, pineapple, lime, and allspice have worked well in libations like the Piñata and the Mytoi Gardens. Once prepared, the punch donated a mint and floral aroma from the garnishes over pineapple and allspice notes with hints of lime on the nose. Next, a lightly carbonated sip displayed caramel, pineapple, and lime flavors, and the swallow rounded things off with rum and allspice elements. Two Fridays ago, I set out in search of a nightcap in Pioneers of Mixing at Elite Bars: 1903-1933. There, I spotted the Prize Winner that came across like an orange spiced Cognac Old Fashioned that seemed like it might live up to its name. Once prepared, it shared a Cognac, orange oil, and caraway-cumin spiced nose that preceded a lightly orange sip. Next, the swallow gave forth brandy, orange, and caraway flavors. Over all, it was a solid tipple, but perhaps not dynamic enough to get a trophy or a ribbon. Shake with ice, strain into a narrow cocktail glass (sub narrow wine glass or small flute) rimmed with sugar, and garnish with a long wide lemon or orange twist (lemon twist) wrapped around the interior of the glass' rim. 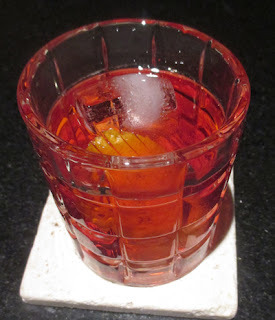 Two Thursdays ago in the midst of Negroni Week, I began pondering what Negroni mashups that I could do. 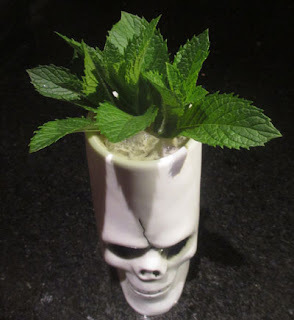 My mind set off in a Tiki direction such as I did last year for Negroni Week with the Negroni on Saturn and as I have done more recently with the Negroni Grog and the Zombie riff The Count Rides Again. Somewhere along the line, it dawned on me that a Crusta would be delightful. I had not touched the 1852 vintage structure since last summer with the Deauville Crusta. In pondering whether to make the added sweetener to balance the citrus and bitters the classic curaçao or the slightly newer Maraschino, I thought "why not both?" akin to what I did with the Bamboo Crusta years ago. 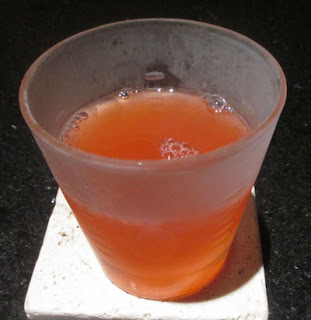 While curaçao would round out the orange flavor in Campari, I have learned from drinks like the Carnivale (née the Pisco Disco) how Maraschino can soften Campari in the direction of Aperol. Lemon juice and Angostura Bitters were the additions that I went with by routine, and I did consider a wide orange swath for garnish but my orange at home has had too much peel taken off of it to make that happen. I ended up sticking with a lemon peel garnish, but orange would not be out of place here. 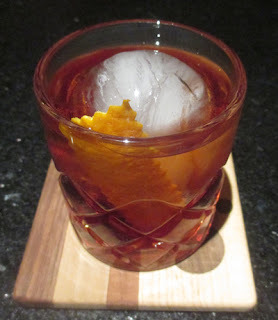 The Negroni Crusta greeted the nose with lemon oil over an orange and grape aroma. Next, the sip mirrored the bouquet with lemon, orange, and grape notes, but the swallow took things in a more complex direction with gin, bitter orange, and nutty Maraschino flavors and a clove and allspice finish. Overall, the citrus and liqueurs worked to make this rather gentle for a Negroni-based drink. Shake with ice, strain into a Champagne flute, and fill with Champagne (~2 oz Willm Blanc de Blancs). I added an orange twist. Two Wednesdays ago, I recalled someone mentioning Charles Schumann's 1991 American Bar book earlier in the week and I reached for my copy. There, I was drawn to the Tropical Champagne that seemed to be a Schumann original that he dated as a 1980 creation. With dark rum and passion fruit in this sparkler, I felt that it was worth a try. Once prepared, the orange twist that I tacked on to the recipe added bright citrus aroma on top of the passion fruit nose. Next, a carbonated orange and lemon sip shared hints of passion fruit, and the swallow presented funky Jamaican rum, passion fruit, and dry white wine flavors. Overall, the drink succeeded in being both tropical and elegant. Stir with ice, strain into a double old fashioned glass with a large ice cube, and garnish with an orange twist. Two Tuesdays ago, I ventured into the Death & Co. Cocktail Book for a nightcap to round off my work night. In the fortified wine section was an alluring amaro-driven number called the Midnight Mountain by Brad Farran circa 2013. 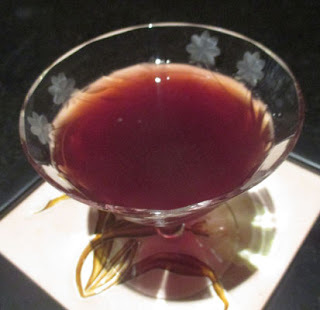 The drink was centered around Amaro Nardini and seemed to build on the chocolate and mint notes that I often find in that liqueur such as in the Stigmata and the Bitter Swagger. Once prepared, the Midnight Mountain shared orange, herbal, and caramel notes to the nose. Next, grape and caramel on the sip slipped into bitter herbal, minty, and chocolate flavors on the swallow. The end result was something more akin to Girl Scout Thin Mint Cookies than Fernet Branca. Stir with ice, strain into a rocks glass with a large ice cube, and garnish with a flamed orange twist (unflamed twist). To mark the beginning of Negroni Week two Mondays ago, I turned to the recipe section of Imbibe Magazine online for their suggestions. The Lodge Negroni called out to me since Scotch has worked rather well in Negroni-like drinks like the Caustic Negroni and Bitter Nail. Moreover, coffee liqueur and Campari have proven to be an excellent pairing in drinks like the Lonnie Desoto and Coffee Negroni. 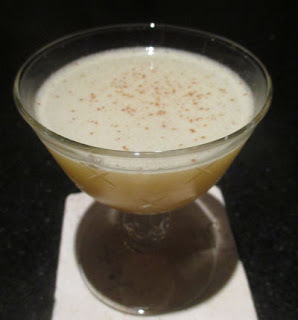 Therefore, I decided to give this drink by James Grant of Edmonton's Wilfred's a whirl. 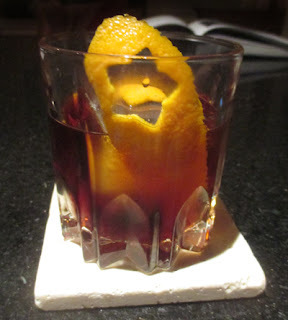 The Lodge Negroni proffered a bright orange nose over peat smoke and darker coffee aromas. Next, grape and roast on the sip gave way to smoky Scotch and bitter coffee-orange flavors on the swallow. Peel the citrus and steep the peels in the three spirits for 6 hours or overnight. Next, juice the citrus and add it to the mixture. Heat the milk to 180°F to scald it; add it, the water, and the sugar to the mix; and stir to dissolve the sugar. Let sit 12 hours or overnight, strain, and bottle. The recipe generates around a gallon of punch and can easily be scaled back a few fold. For a more detailed protocol on Drink's milk punch production, see this post. Two Sunday nights ago, I was prompted by a discussion of clarified milk punches on Facebook to look into my liquor shelves. One of the participants in that thread was Drink alumni Scott Marshall who commented that he had come up with a Chartreuse Milk Punch recipe that was rather good. That reminded me that I had a small bottle of said punch that he had gifted me at Tales of the Cocktail 2011. Soon after, I sent Scott a message asking for the recipe and permission to share it, and he was enthusiastic that it would be given new light. Scott sent me two recipes that varied by citrus type, amount of water, and resting times, and I merged the two here. The name provided was Vert Poinçon de Lait, or the green hole-punch (as in a ticket punch) of milk, and the punch after 7 years of resting looked rather good albeit with a layer of sediment on the bottom. For a more detailed protocol, see the link above that leads to Drink's Rum-Hibiscus Milk Punch recipe instructions. The bottled-aged Vert Poinçon de Lait when served at room temperature greeted the nose with a citrus notes and green herbal aroma that was oregano-like as its dominant aspect. Next, a syrupy smooth but not sweet sip shared some lime accents, and the swallow was a gentle medley of Batavia Arrack and herbal flavors. Overall, the nose was more reminiscent of Green Chartreuse while the flavor itself was more akin to Yellow Chartreuse. Shake with ice, strain into a cocktail coupe, and garnish with lime (floated lime wheel). Two Saturday nights ago, I ventured into Shanna Farrell's Bay Area Cocktails book and came across the Agricole Daiquiri by John Fragola of Beretta in San Francisco. Since a Daiquiri Time Out seemed appropriate, I got out my two rums, my cane syrup, and a lime for juicing and set to work. 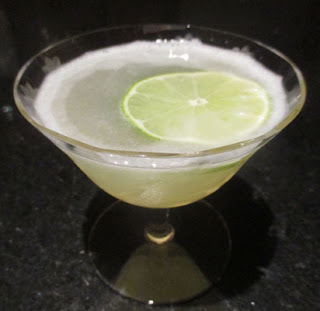 Once mixed, the Agricole Daiquiri donated a grassy nose brightened by lime aromas. Next, the lime continued on into the sip where it was balanced by the cane syrup, and the swallow gave forth grassy and funky flavors. Overall, it was bold with a lot of character all while still being rather approachable. Two Friday nights ago, I had just closed up the bar and needed to get some sleep before I opened the bar for brunch the next day. However, I felt the need to pamper myself with a drink, so I compromised and took a low proof approach that would not muck with my sleep quality as greatly. For a selection, I opted for Pioneers of Mixing at Elite Bars: 1903-1933 and found the Victor. The Victor had the curious combination of Crème Yvette and Amer Picon that I recalled working well in the Manhattan riff the La Salle from the same book, and the presence of pineapple juice could do no harm in this sherry cocktail. The Victor offered a bright floral and berry nose with darker undertones from perhaps the sherry and Picon. Next, grape and pineapple mingled on the sip, and the swallow gave forth nutty grape and floral flavors with a tropical bitter orange finish. 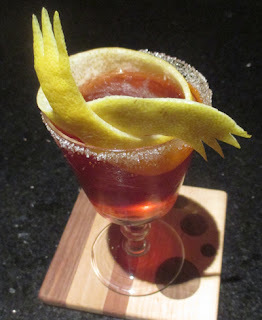 Two Thursdays ago, I was browsing the BarNotes app for interesting recipes when I spotted a Cognac Negroni riff called the Phoenix Feather in a section dedicated to the upcoming Negroni Week. 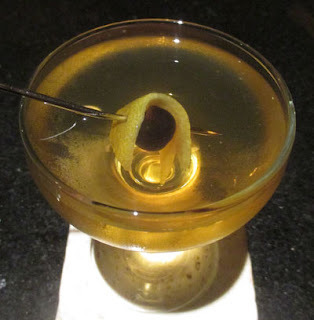 The drink was crafted by T. Read Richards while at the Valkyrie in Tulsa, Oklahoma, and he described his creation as, "An original that was conceived as a quick insomnia cure. 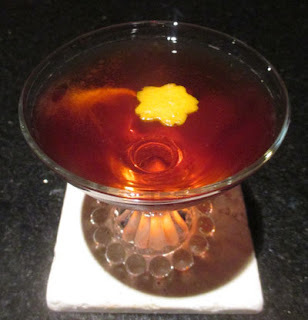 A brandy Negroni, with altered proportions and a touch of earth from the Benedictine." Once mixed, the Phoenix Feather shared a grape and orange aroma that preceded a grape-driven sip. Next, Cognac, bitter orange, and herbal flavors rounded out the swallow. Overall, it was not as bitter as many Campari cocktails perhaps due to the smoothing effect of Benedictine, and Andrea noted that the combination here offered a hint of Coca Cola. Two Wednesdays ago, I was in the mood for a lower proof drink to round out the evening. I began thinking about Tiki drinks that I could alter to utilize an aromatized or fortified wine as the base, and I ended up on Trader Vic's Tonga from the punch section of his 1946 Book of Food & Drink. To the original, I replaced the rum with dry oxidized sherry, swapped passionola for passion fruit syrup, and changed the proportions of lemon, orange, and grenadine. Once prepared, the Sherry Tonga greeted the nose with mint aromas over brandy, berry, and tropical notes. Next, orange, lemon, passion fruit, and berry on the sip led into nutty sherry on the swallow with a tropical finish. 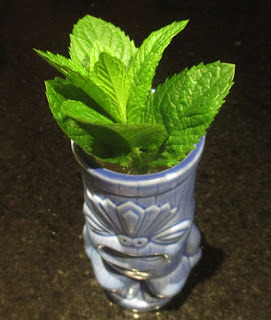 Shake with ice and pour into a Tiki mug (shake with ice, strain, and fill with crushed ice). Garnish with a pineapple wedge and a cherry (mint sprigs). On Tuesday night two weeks prior, I was in a Tiki mood and began thumbing through David Montgomery's Zombie Horde book. 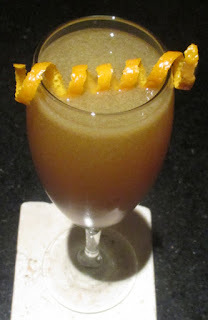 There, I spied the Mandarin House Zombie that appeared like a Planter's Punch more than a Zombie with layers of complex flavor and spice; the recipe was a more modern one created at the Mandarin House restaurant in San Diego during the juice-forward era of the 1970s. Once prepared, this Zombie riff offered a mint aroma over a vague fruit note and the dark rums' caramel. Next, caramel, berry, lemon and tropical flavors on the sip led into pineapple and dark rum on the swallow with rum funk and additional pineapple notes on the finish. Two Mondays ago, I ventured into the Tales of the Cocktail 2009 recipe book, Stir Your Soul, to uncover a lost gem. There, I spotted the San Remo by Thomas Waugh then of Death & Co. who offered up this drink at the St. Germain tasting room that year. I pondered the vagueness of the "amaro" ingredient and figured that was the reason why I had passed over this recipe each time. San Remo is in on the coast in the northwest part of Italy, and S. Maria al Monte is produced somewhat nearby. However, I lacked that amaro and opted for Averna instead figuring that it would allow the featured Crème Yvette to shine. I did consider Campari especially with how well it worked with the liqueur in the El Brioso. The San Remo gave forth an orange oil, whiskey, and berry bouquet to the nose. Next, grape and berries on the sip preceded rye, cherry, bitter herbal, and floral elements on the swallow. Overall, the San Remo reminded me of a more complex Caboose. Shake with ice and strain into a double old fashioned glass. 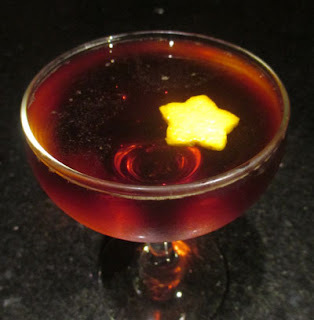 Two Sundays ago, I ventured into Brad Parson's Amaro book for a drink idea. 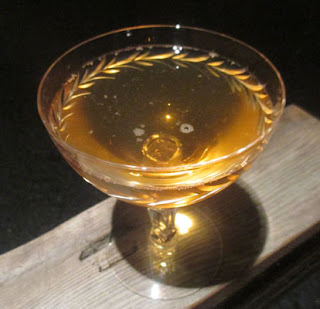 There, I gravitated toward the Juniper #3 by John deBary of Manhattan's Momofuku Ssämbar. The gin, apricot, Campari, and lemon reminded me of the St. Botolph Club and the pinch of salt in the mix made me think of the Absent Stars. deBary described the Juniper #3 as, "It tasted like someone was making a Whiskey Sour and a Negroni at the same time and accidentally poured them into the same glass." The gin I used was only lightly barrel aged, so it would not fully offer up the whiskey-like note in that description though. The Juniper #3 gave forth an apricot, orange, and floral aroma that led into a lemon and orchard fruit sip. Next, the swallow shared juniper, apricot, orange, and herbal flavors, and overall, the balance was rather on the dry side here. Shake with ice, strain into a cocktail coupe, and garnish with a pinch of cinnamon (freshly grated cinnamon). 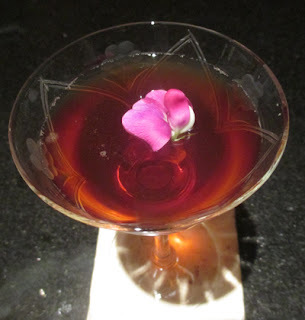 On Saturday night two weeks ago, I spied the Wildflower in Food & Wine: Cocktails 2011 that seemed like a curious Daiquiri of sorts with a Cognac component like the Boukman Daiquiri and a maple syrup one like the Volcano Bowl and Mr. Howell. Moreover, it was shaken with an orange wedge akin to Sam Ross' Too Soon?. This recipe was called the Wildflower crafted by New York City bartender Richard Boccato as his riff on the Night Flight from Trader Vic's 1947 Bartender's Guide. The Wildflower proffered a cinnamon, orange, and grassy nose. Next, maple's richness countered the lime on the sip, and the swallow paired the Cognac and funky rhum followed by a maple and citrus finish. Moreover, as time went on, the cinnamon from the garnish began leaching into the flavor profile. Stir with ice, strain into a cocktail glass, and garnish with a cherry and a lemon twist. Two Fridays ago, I pointed my night's drink search to the pages of Ted Saucier's Bottoms Up. There, I was lured in by the Eye Opener that seemed like a Metropole Cocktail with a combination of Fancy and Improved flourishes. Once prepared, the Eye Opener shared a lemon oil, Cognac, and orange peel aroma to the nose. 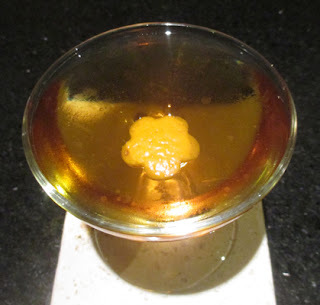 Next, a semi-sweet white wine sip gave way to Cognac, nutty, orange, and absinthe flavors on the swallow. I later discovered that this recipe was rather similar to the Morning Cocktail from Boothby's 1934 World Drinks And How To Mix Them. Stir the gin and bitters with ice and strain into a cocktail glass. Next, carefully add the port and let it settle to the bottom of the glass. After making the Princeton Cocktail from Pioneers of Mixing at Elite Bars: 1903-1933, I decided to make the older and relatively better known Princeton from George J. Kappeler's 1895 Modern America Drinks. Kappeler's recipe is a layered cocktail of a bone dry Old Tom Gin Martini floating on top of a port wine base. After carefully layering the drink, the nose offered a piny juniper aroma in an almost grapefruit-like way. Next, a semi-sweet sip transitioned into pine on the swallow, and as the port began to enter into the equation, the drink gained grape richness on both the sip and swallow. Moreover, towards the end, the balance shifted more to juniper-flavored port. Two Wednesdays ago, I selected the Death & Co. Cocktail Book to guide me for the evening's nightcap. There, I spotted the Puerto Rican Racer which was one of their riffs on the Diamondback that called for Puerto Rican rum instead of rye whiskey and added a touch of grenadine and Peychaud's Bitters to the mix. Since I had enjoyed their brandy riff, the Sidewinder by Phil Ward, I was game to try Thomas Waugh's 2009 creation named after another poisonous snake. The Puerto Rican Racer greeted the nose with an apple aroma accented by herbal notes. Next, caramel and honey with a hint of berry on the sip led into rum, apple, and minty-herbal flavors on the swallow. Stir with ice and strain into a fancy glass. Two Tuesdays ago, I reached for William Schmidt's 1891 The Flowing Bowl in search of an elegant oddity. 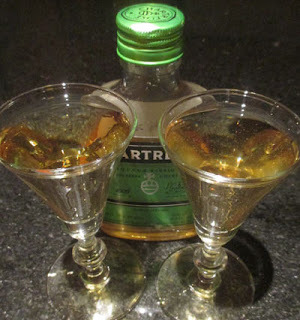 There, I selected the Invitation that came across like an absinthe-tinged Adonis which sounded rather delightful and seemed to suggest by both the name and the ingredients that it would make for a fine aperitif. In the glass, the Invitation reached the nose with nutty grape aromas brightened by minty herbal accents. Next, a semi-dry grape sip was followed by a sweeter and rounder grape flavor on the swallow that led into an anise-herbal finish. 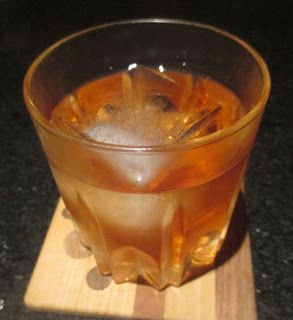 Dash bitters onto the sugar cube in a Collins glass, add vermouth followed by ice, and top with ginger ale. I recently was reminded of the Roofgarden from the 1935 The Old Waldorf-Astoria Bar Book and then realized that it was probably the inspiration for Brick & Mortar's Rooftop Cooler. Therefore, two Mondays ago I decided to make this recipe that reminded me of a low proof Champagne Cocktail given the bitters-dashed sugar sugar cube and carbonated component. Once assembled, the Roofgarden gave forth a ginger, cinnamon, and clove bouquet. Next, a semi-sweet carbonated sip led into a herbal, ginger, and spice swallow. With a sugar-sweetened (instead of corn syrup) and slightly drier ginger ale, the Roofgarden was an elegant low ABV refresher. On Sunday night after my work shift, I began perusing Pioneers of Mixing at Elite Bars: 1903-1933 for a glossed-over gem. There, in the American whiskey section was the Newton that appeared like a Manhattan laced with Byrrh Quinquina which seemed like it had to be a winner. I upped the 2 dashes of Byrrh to a half ounce (one-sixth of the drink build) to allow the ingredient a chance to shine. Once prepared, the Newton offered a sweet herbal and grape bouquet to the nose. Next, grape and malt mingled on the sip, and rye and dry cherry and grape flavors rounded off the swallow with a bitter quinine and clove finish. 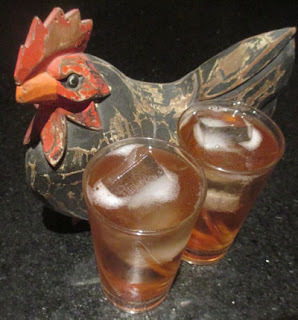 Two Saturdays ago, I spotted a recipe on the Kronan Swedish Punsch Facebook page called the Lucky Bird that seemed delightful. Not only did the recipe sound alluring with its Swedish punsch-apricot liqueur combo that worked well in the Havana Cocktail and other drinks, it was made by Arthur Boothe whom I met on my 2016 USBG-sponsored excursion to the Patron distillery in Mexico. Arthur crafted this drink for the Spring menu at Bitters & Brass in Sanford, Florida. The Lucky Bird greeted the senses with a caramel rum aroma with fruity and chocolate undertones. Next, caramel notes with hints of orchard fruit on the sip were chased by rum, apricot, tea, and funky Batavia Arrack flavors on the swallow with a chocolate finish. Two Fridays ago, I began perusing the Pioneers of Mixing at Elite Bars: 1903-1933 book for the evening's drink. There, I spotted the Princeton that seemed like a refreshing brandy libation. 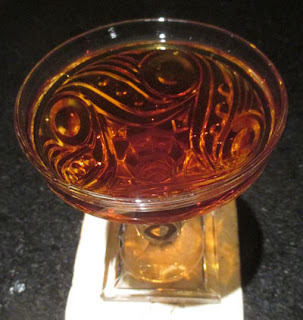 The better-known Princeton was first published in 1895 by George Kappeler in Modern American Drinks as a layered cocktail of 1 1/2 oz Old Tom gin and 3 dash orange bitters that were stirred and strained into a cocktail glass before a 1/2 oz port was carefully sunk to the bottom. Here, the Princeton was the brandy, sweet vermouth, and pineapple juice with bitters. Since Amer Picon works so well with pineapple, I took that route instead of Boker's. 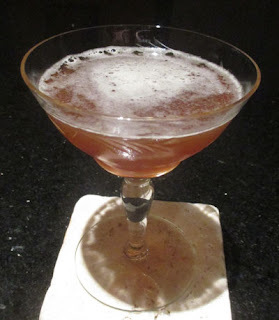 I initially was reminded of a brandy Algonquin of sorts, but the combination was a common one in Pioneers with the rye one appearing twice here in the blog as the Radio Call and the Franklin Square. Once prepared, this Princeton offered up grape and dark fruit bouquet to the nose. Next, grape, caramel, and a tropical note on the sip transitioned into Cognac, pineapple, and bitter orange flavors on the swallow.